Contrary to popular belief, snacking is a healthy practice -- as long as you're choosing the right snacks. These roasted chickpeas are so simple, healthy, and most importantly, delicious! Are you snacker like me? Well, I've got just the thing for you! Contrary to popular belief, snacking is a healthy practice -- as long as you're choosing the right snacks. 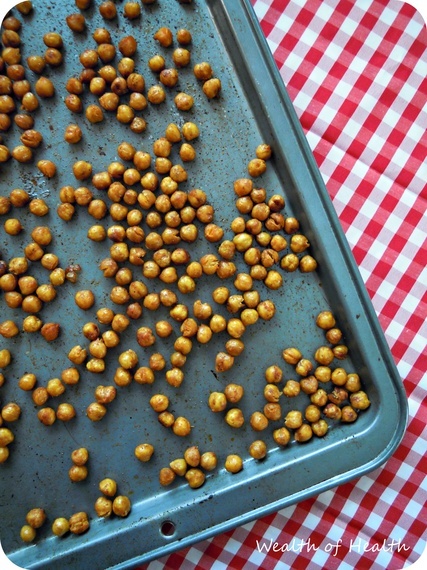 These roasted chickpeas are so simple, healthy, and most importantly, delicious! Once they are roasted, chickpeas become crunchy and flavourful, which makes them the perfect pop-in-your-mouth snack. The high protein and high fibre benefits of chickpeas help to control hunger by keeping you feeling full and satisfied. Their high amount of soluble fibre helps to reduce cholesterol levels, and they also offer a good dose of both iron and folate. Pack in airtight containers for work/school lunches or on-the-road snacks. You can also freeze them in an airtight container and re-roast for five to 10 minutes.